This weekend’s scandal involving the Australian cricket team and their attempt to cheat against South Africa has made world news. Even CNN had a ticker running in the subject and Americans don’t even watch cricket. For those that haven’t been paying any attention to the news – on Saturday, as the third Test match in their current series slipped away from them, the Australian team conspired to alter the state of the ball in order to receive an unfair advantage,. The attempt was captured on camera and, in the subsequent fall out, the captain, Steve Smith, admitted to a premeditated plan, agreed the leadership, to cheat. 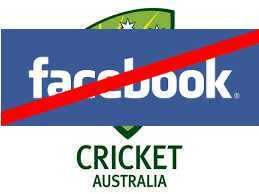 The story is unfolding but the reputation of the Australian cricket team, and unfortunately by extension Australians in general, is at an all time low. Previous victories over the .last several years, where the ball began to move very early in the game, will be in question. With vast amounts of money, and the reputation of Australia and Australians at stake, it will be interesting to see how Cricket Australia reacts. As this is written, it seems that pressure from sponsors, as well as general outrage from the Australian public will mean severe punishments for the players and coaching staff implicated. Meanwhile, on the other side of the world, Facebook has been dealing with a scandal of its own. Last year, I posted about how social media advertising, particularly on Facebook, had a significant influence on the outcomes of both the Brexit and the US Presidential elections. This story has finally gone mainstream in the United States, with revelations that Cambridge Analytica mined not only the data of participating Facebook users, but also extended their reach to mine the personal details of friends of these users. This data was then used to place targeted fake news stories to influence voters to vote for Trump. These trust issues were exacerbated by further revelations that the company’s Android apps may have been illicitly capturing and sharing call and contact information from the user’s mobile phone. In last week’s post, on GDPR and PoPIA, I talked about how these privacy regulations (GDPR in Europe and PoPIA in South Africa) require companies to change the culture of the organisation by ensuring accountability for the use (and abuse) of personal data. The governance of data must include processes and clear polices to ensure the ethical use of personal data. Data privacy is a consumer rights issue. The Facebook story could happen to you. It is time to start taking data privacy seriously – not just because it is regulated, not just because it is the right thing to do, but because it is a good business decision.